When visiting Gatlinburg, enjoy something extra good for your body and soul with a visit to Whole Earth Grocery. This cafe and store offers vegetarian & vegan food & products, natural foods & items. The food is delicious, with great sandwiches, wraps and other lunches. This all-natural cafe and shop is your one-stop Smoky Mountains food store that aims to please the palate in more ways than one. Whole Earth is a two-for-one location with fresh food and an assortment of health items that will turn a one-time visitor into a repeat customer. The vegetarian and vegan cafe is the perfect place to stop for many reasons: whether you’re heading out for a day of sightseeing and want a quick bite, you’re planning a picnic while hiking and you want to order a few carry-out items, or you’re in the middle of exploring Gatlinburg’s many superb shops or the Great Smoky Arts & Crafts Community Trail. Combine a trip to Whole Earth Grocery with a visit to Smoky Mountain Winery, since both are located in Winery Square, a slightly off-the-beaten-track area filled with good surprises. If you want a little more “bite” chow down on a tasty lentil burger or get wrapped up in flavor with one of the delicious veggie, chicken, tuna, or egg salad wraps. Add a side dish of pasta or potato salad and crunchy organic blue corn chips and your appetite for a nutritious meal will be more than satisfied. Whoever thought a cafe isn’t capable of serving good shots hasn’t stopped by Whole Earth to try a wellness shot that packs a punch of healthy goodness. Consider a Power Shot made with wheat-grass, lemon and ginger, a Fuego shot mixed with lemon, ginger and turmeric with cayenne for a little extra kick, or a flavorful Julius with tangy orange, lemon and ginger. Once you step inside the grocery, you won’t know which way to go with so many different shelves lining the walls and counters filled with natural products. Whether you dine at the cafe first then peruse the store’s inventory, or vice versa, the two are a winning combination of natural goodness you’ll want to experience more than once. The store’s inventory includes a wide variety of herbs and supplements, essential oils, fragrant soaps, vitamins, organic foods, seasonal produce, aromatherapy, natural beauty products, homeopathic remedies and much more, from brands such as Nature’s Plus, Natural Factors, Renew Life, Enzymatic Therapy, Solaray, Twinlab, Source Naturals and more. Whole Earth Grocery also now carries the superb dinnerware and unique handmade pottery of Alewine Pottery, so you can buy both your plate and the meal to put on it, all in one stop! Whole Earth Grocery is open six days a week. Store hours are Monday thru Friday from 10 a.m. to 6 p.m., and Saturday from 10 a.m. to 5 p.m. Remember also, if you’re staying in one of our Gatlinburg rental cabins or Pigeon Forge cabins, that services exist to buy your groceries in advance and stock your cabin with your order prior to your arrival. See our In-Cabin Services feature on Smoky Mountain Grocery shopping & delivery service. The reviews are in and each one has only good things to say about the quality food served in the cafe, the friendly atmosphere, and the stocked shelves of natural products designed for a health-conscious lifestyle. 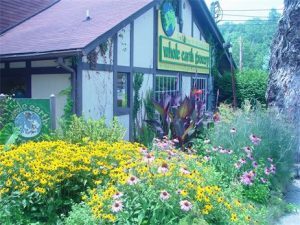 So when your day in Gatlinburg is planned around exploring for hidden gems, add the Whole Earth Grocery to your itinerary of “must do” destinations. The Whole Earth Grocery is a small jewel set amid the goings-on of a popular city and provides an oasis of flavor for travelers with good taste and a penchant for good health, too.